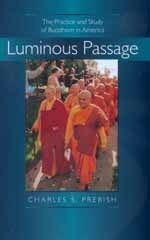 In Luminous Passage a well-known Buddhologist and longtime observer of Buddhism in the United States presents the first comprehensive scholarly study of American Buddhism in nearly two decades. Charles S. Prebish revisits the expanding frontier of the fastest growing religion in North America and describes its historical development, its diversity, and the significance of this ancient tradition at century's end. More than anything else, this is a book about American Buddhist communities (sanghas) and about life within those communities. Prebish considers various Buddhist practices, rituals, and liturgies, as well as the ways these communities have confronted the changing American spiritual landscape. In profiling several different sanghas Prebish reveals the ways that Buddhism is being both reinvented and Westernized. He includes the first exploration of the American Buddhist "cybersangha," a community that has emerged from recent developments in information-exchange technology, and discusses the growing community of "scholar-practitioners." The interactions of Buddhist identities that are related to ethnicity, gender, sexual orientation, social engagement, and the healing professions are also examined. This book fully captures the vibrancy and importance of Buddhism in American religious life today. Finally, Prebish appraises the state of Buddhism at the millennium. Placing the development of American Buddhism squarely in the midst of the religion's general globalization, he argues for an ecumenical movement which will embrace Buddhist communities worldwide. Charles S. Prebish is Associate Professor of Religious Studies at Pennsylvania State University and author and editor of numerous works, including Buddhist Monastic Discipline (1975), American Buddhism (1979), and A Survey of Vinaya Literature (1994). He is coeditor of The Faces of Buddhism in America (California, 1998) and also coeditor of the electronic Journal of Buddhist Ethics.